It was certainly no classic, but who cares? For ever and a day, people will remember who won the 2018 Champions Cup final, not how it was won. It was a strange game in so many ways. The rain and greasy ball took away the quality, and I feel it was Leinster who suffered more for that. How times have changed when it is an Irish side going to Basque Country and cursing the weather while the original aristocrats of French rugby wallowed in the difficult playing conditions. And we should give credit where credit is due as Racing cut their cloth and played to a plan that until the last few minutes had them on course for a first Champions Cup star on their famous light blue and white jersey. In the end it was Leo’s Leinster Lions timing their acceleration up the final straight to perfection. Before that, they struggled to impose themselves. Such was the quality of the Racing defence – particularly their line-speed – that Leinster never found the attacking rhythm that makes them the outstanding side in Europe. Credit Racing too for having to replace both first-choice half-backs as well as losing the greatest No 10 in the game’s history from their bench. Given the circumstances they did themselves and the Top 14 justice. What we got was an arm wrestle, a dog fight from first whistle to last. It wasn’t exciting but it was ultra-competitive and utterly absorbing. In replacement scrum-half Teddy Iribaren they’ve got a gem. He was superb: while the loss of Pat Lambie and Dan Carter ultimately proved fatal, the absence of No 9 and skipper Maxime Machenaud was hardly noticed. The heavy pre-match rainfall made ball-handling difficult. We know this Leinster squad can play any way, and in Bilbao the only option was the Munster route – and how gratifying was that? They managed to dominate possession but with Racing killing the quality of that ball at source or through their consistent rush defence, Leinster were having to think on their feet. Much of the talk in the build-up centred on the need to take their game ‘to another level’. While this wasn’t what they had in mind, their tactics were the perfect fit for the problems posed on the biggest day. It meant having to mix it in a war of physical attrition, but they did – and how. I love to see the game played at pace and with panache — think Leinster’s wins over Northampton in 2011 and Ulster in 2012 – but when the elements dictate otherwise the great teams adapt accordingly. 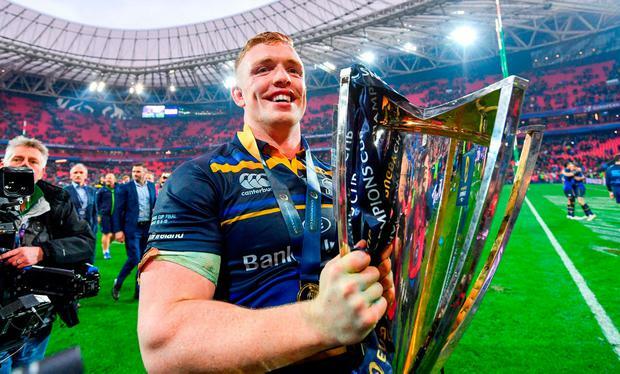 That’s what Saracens did when they beat Racing in the final a couple of years back, and on Saturday, that’s exactly what a great Leinster team did. Leone Nakarawa was named Player of the Tournament in the aftermath, and again in Bilbao along with Bernard Le Roux and Yannick Nyanga he was immense, but the outstanding individuals on this day of total commitment were all from Leinster, with the exception of the outstanding Iribaren. And whoever made the official call got it spot on. Just how good was James Ryan? And the mind boggles when you think how good the second-row might become. He didn’t lick it off a stone. His father Mark was a flanker for Lansdowne and Leinster, and was just like his son: powerful, at his most effective in the tight and physical exchanges. But it is James’ maturity, that is way beyond his years, that has me drooling. Against Racing he was again on fire, with his former schoolmate Dan Leavy close behind. Not long after the retirement of Paul O’Connell – by common consensus the greatest second-row in our history – along comes Ryan. He is a product of the system that will make Leinster a force for a very long time to come. There was not a whiff of a try, yet it was an absorbing contest. The fare won’t linger too long in the memory but I doubt there were too many kettles boiled here or in France during the game. Some might call it winning ugly, yet for most supporters Isa Nacewa’s winning penalty from in front of the sticks was a thing of beauty. It was the first time Leinster had been ahead and how appropriate that the player who is now undisputed as the greatest club import ever should be the one to steer home the best team in the competition. Having put two kicks sloppily out on the full, his confidence might have been suffering when with 10 minutes to go Johnny Sexton was receiving attention at penalty-kicking time. Not a bit of it. Up stepped Nacewa to nail it and then the winner with conviction. Robbie Henshaw was also prominent in his attempts to run at the powerful French midfield, particularly when the tide was flowing the other way. And that same comment applies to Rob Kearney at the end of another fantastic game and season. Well almost the end. There’s still a bit to go, resuming in the RDS in a few days’ time. Pity it’s not the Aviva as they’d pack it out again. Still, Ballsbridge will be rocking. But a physical and emotionally draining weekend for Leinster while Munster rested up would seem to point one way. Don’t you believe it. Irrespective of celebrations the result in Bilbao is exactly what Munster didn’t need. Leinster will be firing on full, nothing surer.